Imaging that you are conducting an email conversation with a business partner or a peer, but that conversation is related to an opportunity and you want to capture the email into Salesforce for future reference. In this example, Email was sent from Philip Dixon at ZB Test Single User, but needs to be filed to the account Integrated CMA. In Gmail, use the ZynBit search bar to type in the information for any Salesforce record, edit the record, file an email, log calls, edit events or tasks, or open the record directly in Salesforce. In this example, the Email can be filed to an Account beginning with the text instead of the sender or any recipients of the email. The Actions toolbar provides all the usual options. The Outlook interface is nearly identical, and search is invoked using the blue magnifying glass at the top of the ZynBit task pane. 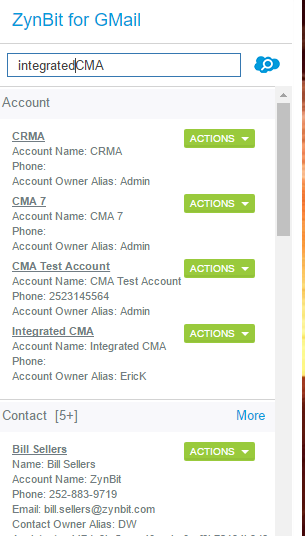 All matching records, including accounts and contacts are displayed. The “card” of information displayed for each entry is based on the Salesforce compact layout. The content can be modified by the Salesforce administrator by creating or changing a compact layout and assigning it to the appropriate profile in Salesforce. The Search bar in ZynBit is directly linked to the Salesforce search API. As such the standard Salesforce best practices for searching also apply here. Use Parenthesis to group search terms together.